This massive structure you can see in the picture above is going to be the biggest building in the world in 90 days. The half-mile high superstructure will be 32ft taller than the Buri Khalifa in Dubai – the current tallest building- and is expected to cost almost half as much. It will dwarf The Shard in London, standing more than 530m above Western Europe’s tallest building and, when completed, will mean nine of the 10 tallest skyscrapers in the world are in Asia. The location of where this building is been made is in China. The cost to make this building is a massive price of US$628 million. China is a vast country. It has a population of 1,344,130,000. It is the country with the highest population in the whole of the world. The Chinese people gave a name to this building: it is called the Sky City. 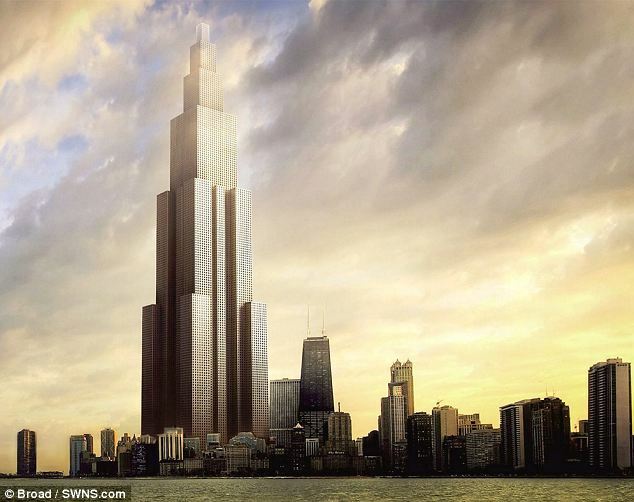 It has a height of 2,749 feet (838 meters) and this building is distributed into 220 floors. The place where this building is going to be standing for the many years is in Changsha city and it is near a river called the Xiangjiang river. The structure of this building will be able to hold 31,400 people of both high and low income and of high and low status. This is a quick video of how the building is going to be made and who are the people who have thought of making this building. It is also going to talk about what the facilities are going to be put in this magnificent building.